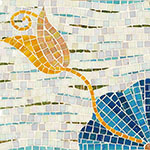 Hakatai offers a beautiful selection of 26 hand-cut, hand-crafted and exquisitely stylish glass mosaic repeating patterns. Each repeating pattern is custom-created according to your color selections and hand-assembled. Ideal for residential as well as commercial applications, glass mosaic repeating patterns bring dimension and modern flare to any space.